deepbluehum wrote: Dzogchen talks different. By the way, as sambhogakaya is only a symbolic representation of dharma teachings and does not perform activities. This is why a rainbow body is a nirmanakaya and not a sambhogakaya. So you're saying all the sambogakaya deity forms are just symbolic representations of dharma teachings? That's not my understanding of what Vajrasattva is, and contradicts the above explanation of Garab Dorje as a Nirmanakaya of Vajrasattva. Please read the annotated passages here http://en.wikipedia.org/wiki/Sambhogak%C4%81ya, and then if you want to put forth an entirely different contradictory version of sambogakaya please do give references. All good posts in this thread, but hard to know where to start, so I am just diving in. Great posts and each is correct from the posters’ point of view. These things are really tricky to talk about - easy to be incomplete, but on balance, I think Futerko’s comment on the inseparability of the three bodies is a good place to start. I think that the three bodies of the Buddha are three ways to talk about different aspects of how a Buddha manifests. Since we are not Buddhas (yet) we use these limited words and concepts to point to what is beyond our own experience, and beyond normal terms of expression. I don't know scriptural citations, or have spiritual experience, but having listened to Dharma talks for a long time, words come out like wind blowing through a bamboo forest, makes sound. If you need citations, please look elsewhere. I apologize for not being a scholar. The Nirmanakaya is the physical form of the Buddha, closest to what we refer to as the normal body. But it is different from the normal human body because it is entered into, and maintained, by enlightened intention - not by karmic forces. A Buddha has no need to be born into, or stay in, a human body. This is why it is always a good idea to request our Teachers to remain. From their side, if they are real Teachers, they do not need to remain. You may wish to think about this and consider all of the great Masters whom you have met, or known to exist, during your lifetime, and who are no longer with us in their Nirmanakaya form. What can we do to help the Enlightened ones, who are still with us, to stay? For the Sambogakaya, perhaps it is good to start by going to the wiki, because this will show how hard it is even for official sources to get it right. Here they are talking about the Sambogakaya as being a "subtle body of limitless form." This is not my understanding. For me, the Sambogakaya is not a subtle body of limitless size. Maybe you can say that the Sambogakaya has the potential to manifest in infinite forms, and this rings true. So maybe they just left off the "s" off the word form. Perhaps the wiki is just not so useful. Enough about Wiki. For me, the Sambogakaya can be spoken of as the energetic body. Sometimes it is called the "enjoyment body," I think, perhaps, because if you enjoy a lot, while in a certain state of contemplation, then this body may manifest. Also, it could also be considered enjoyable, because it is made of energy, and, since it is not physical, cannot be harmed by disease, fire, heat/cold, or death, etc. Sometimes it is called a body of light, because from the Buddha's point of view, I think that that is what it feels like and is perceived as. Sometimes it is called the speech aspect, because speech can be considered the closest to a pure energy manifestation of the three ways of talking about existence as body, speech, and mind. I think it may be also sometimes useful to think of the Sambogakaya as a reification of idealized qualities, or embodying a certain collection of qualities, such as the "manifestation of the qualities of Vajrasattva." This does not define the Sambogakaya, but the Sambogakaya can lend its qualities to an idealized collection of qualities, such as Vajrasattva. Hence, Vajrasattva, as a Sambogakaya form, can be thought of to intrinsically possess, and represent, a collection of idealized qualities. The Sambogakaya may also be thought of as a possible bridge between the Nirmanakaya and the Dharmakaya, in both directions. Through strong intention, a Nirmanakaya, manifesting a Sambogakaya, while alive, or at the time of death, can transcend the death of the human body. Through strong intention, the body of light continues even after the death of the human body. In the same way, through continuity of intention, an un-embodied Sambogakaya can manifest an intentional rebirth as a Nirmanakaya when the opportunity presents itself. This explains the possibility of the continuation of consciousness across several lifetimes, such as in the case of Tulkus and the Dalai Lama. It also explains why Garab Dorje, the originator of Dzogchen, can be referred to as the Nirmanakaya of Vajrasattva, a Sambogakaya being. Just as the Nirmanakaya, through contemplation, can generate a Sambogakaya, so the Sambogakaya, in contemplation, can become the Dharmakaya. In all these ways you can see how the Sambogakaya can be spoken of as a link between the Nirmanakaya and the Dharmakaya. Please to remember that talking about the qualities of the three bodies of the Buddha are really just ways of talking about the qualities of one Buddha. I think that everyone has the potential to see, and to be in, the Sambogakaya, but only those who are sensible to this energy, actually see it, or can be in it. This capacity can be developed through spiritual practice. Perhaps when this capacity is accomplished, then it is easier to enter into the contemplative state of the Dharmakaya, which has no characteristics, or claims, whatsoever. Perhaps this could also be called creative visualization and absorption. This shift into a capacity for experiencing a different sensibility is what happens in the pointing out instruction and is strongly enabled by the Yangtig practices of the dark retreat, trek cho and togal. The Dharmakaya is the manifestation of the Buddha, in pure form, without any named qualities whatsoever. It is the source from which all qualities manifest. This does not imply or necessitate, a causal relationship, but is just a way of talking about things from a certain point of view. The rainbow body, (to keep on topic) as spoken of in Dzogchen, may display as a Nirmanakaya form, a Sambogakaya form, or both, at the same time. It somewhat depends on the capacity of the viewer. Someone who has obtained the rainbow Body may choose to continue on in their Nirmanakaya form, and normal people would see this. Their energetic, Sambogakaya form would be seen by those who have capacity to see it, both while they are alive and also after, if the Being with the Rainbow Body, makes the intention of keeping a manifested Sambogakaya form after death. When these forms completely dissolve into the Dharmakaya, then it is called the Great Transfer and nothing is left, and no one can see these forms. Perhaps someone who is a Dzogchen Master, can, at will, dissolve their Nirmanakaya into their Sambogakaya, and also their Sambogakaya into the Dharmakaya. This explains why their appearance can alter during transmission. Perhaps these questions are more appropriately asked of a real spiritual Teacher. I am just babbling. Sorry if I have confused anyone. Ask questions if you want to. Perseverance furthers! Long life to the Masters. May they live long, in good health and with success in all things. Last edited by oldbob on Tue Jan 22, 2013 3:32 am, edited 6 times in total. It's fun to read what you have said oldbob. Thank you for sharing. I'm confused as I read this thread (and now have an aspiration to travel to Wu Tai Shan, preferably with Yudron & Adamantine if they'll have me). Are Rainbow Body and Body of Light the same thing? I'm thinking of the phenomenon that Guru Rinpoche manifested where he was still active in the world, still "alive," but lacked eyebrows, as distinct from the phenomenon at the moment of death as manifested by realized masters such as Nyagla Pema Dundul. Do different terms correspond to these? Which of these is the OP referring to? Rainbow body is the result when elements return to their essence of five colors. Body of light is the realization that he's you there. I don't make this stuff up. It comes from my lineage. When Vajradhara wanted to teach dharma to the 10th Bhumi bodhisattvas he didn't say a word, he transformed into Vajrayogini. Why is that? Because Vajrayogini is not a being, she is a symbolic teaching. All sambhogakayas are like this. Again it doesn't contradict anything except what you get. Absolutely seen, only the Dharmakaya is real; Sambhogakaya and Nirmanakaya are "provisional ways of talking about and apprehending it"
Jikan wrote: I'm confused as I read this thread (and now have an aspiration to travel to Wu Tai Shan, preferably with Yudron & Adamantine if they'll have me). Are Rainbow Body and Body of Light the same thing? I'm thinking of the phenomenon that Guru Rinpoche manifested where he was still active in the world, still "alive," but lacked eyebrows, as distinct from the phenomenon at the moment of death as manifested by realized masters such as Nyagla Pema Dundul. Do different terms correspond to these? Which of these is the OP referring to? Count me in to Wu Tai Shan , if you will have me, and if we can avoid the pollution of the big cities. Great read, great pics and captures the flavor of the mountains. 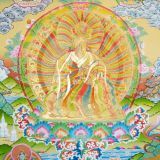 "The rainbow body, (to keep on topic) as spoken of in Dzogchen, may display as a Nirmanakaya form, a Sambogakaya form, or both, at the same time. It somewhat depends on the capacity of the viewer. Someone who has obtained the rainbow Body may choose to continue on in their Nirmanakaya form, and normal people would see this. Their energetic, Sambogakaya [body of light] form would be seen by those who have capacity to see it, both while they are alive and also after, if the Being with the Rainbow Body, makes the intention of keeping a manifested Sambogakaya form after death." To me, it makes sense of the stories of what Guru Rinpoche manifested while he was in the world (with no eyebrows) if I think of these manifestations as Sambogakaya, body of light, manifestations, from his Nirmanakaya body. This allowed him to manifest the powers that seem miraculous to us, such as walking on water, not being burned by fire, flying in the air, leaving hand and foot prints in stones, etc. These powers are manifested by him in his Sambogakaya, body of light form. The phenomena at the moment of death that Guru Rinpoche, Nyagla Pema Dundul, and many others manifested, which is sometimes talked about as the rainbow body is the Nirmanakaya disolving into the Sambogakaya, and then the Sambogakaya dissolving into the Dharmakaya. (I believe that all of this is done without using one word or thought.) This is also spoken of as the 5 elements of the body dissolving back into the 5 lights, and the lights then dissolve back into the Dharmakaya. The OP asked: "What happens to the rainbow body if it is not actively maintained? Is it something that can be lost?" As to whether he is referring to the body of light or something else, I don't know. He has to say. If I had to guess, I would guess that the OP is referring to the rainbow body at the time of death. Here we are talking about the phenomena where the body grows smaller and smaller and ultimately vanishes (except for hair and nails). I would say that the process is permanent because I have never heard of anyone reconstituting a Nirmanakaya from a dissolution into the Dharmakaya. Now - if you can take the pointing out instruction, and follow the practice advice, from a realized Dzogchen Master, maybe you can "go rainbow" too. I thin the best thing is, as some have suggested, that we all go to Wu Tai Shan and talk to Vimalamitra about it together. Thank you so much for all good informations! ps: Have a nice travel. Thanks for the insights, Bob! FYI, I'm planning a pilgrimage to Wu Tai Shan during the summer of 2014. (This year we're planning on a trip to Bhutan in October-November. We're still discussing the details of the itinerary with our guide. We will be opening this trip up to other Vajrayana Buddhists, and I will be posting details in the Events section when I know them.) In any case, if we go to Wu Tai Shan in 2014, we will make that trip available to other Buddhists as well. (My wife and I have led six previous trips to China.) Both myself and a close Dharma friend have made vows to visit Wu Tai Shan in this lifetime. These are not money-making ventures, and the costs will be basically our costs to run and administer the trips. 2014 (as opposed to 2013) would give people time to arrange their finances and vacation time. pemachophel wrote: FYI, I'm planning a pilgrimage to Wu Tai Shan during the summer of 2014. (This year we're planning on a trip to Bhutan in October-November. We're still discussing the details of the itinerary with our guide. We will be opening this trip up to other Vajrayana Buddhists, and I will be posting details in the Events section when I know them.) In any case, if we go to Wu Tai Shan in 2014, we will make that trip available to other Buddhists as well. (My wife and I have led six previous trips to China.) Both myself and a close Dharma friend have made vows to visit Wu Tai Shan in this lifetime. These are not money-making ventures, and the costs will be basically our costs to run and administer the trips. 2014 (as opposed to 2013) would give people time to arrange their finances and vacation time. 2014 sounds good. I do have another trip planned for this year. Ok, I am keeping an open mind about this June or 2014. . .
Vima and Majushri, I'm eager to go. Who has their cell phone numbers? Ooooooh, I will have graduated nursing school in June 2014! Am planning to treat myself and my girlfriend to something like this. Will have to keep this in mind!!! Dharmakaya, Sambhogakaya and Nirmanakaya, it could be that the terms are used in different ways, have different meanings. Everything that exists (or that is seen as existing) must exist in at least one of them. Nirmanakaya - physical or material; form. A rainbow body would be of the Sambhogakaya, it's not material in any way. I would often take one or two strange experiences of the multitude i had during the week to my darshon with my teacher, the founder of our sangha. He would often just say, that's Sambhogakaya. I can see it at times, move within it, am aware of it. What i do is just awareness, not attainment. Isn't a rainbow body a high level of attainment? I remember it being mentioned in our teachings, but i don't remember much. I have seen it though a few times, our teacher's. Once i was walking across my backyard, every step i took was through a different color light. When i mentioned it at darshon, he said, "That was my rainbow body." It surprised me then. He had been nowhere in the vicinity at the the time. Sambhogakaya body, bliss or enjoyment body of the bodhisattvas who 'dwell' in the Sambhogakaya 'realm'? For me, the Sambogakaya is a subtle body of limitless size. I would say that the Sambogakaya has the potential to manifest in infinite forms. The more i see the bigger and more incomprehensible they both become, both realm and bodhisattva. How would one measure the infinite nature of either? I think the limitations we impose on them are due to the limitations of our conceptual minds. By the way, where does astral projection or dreams take place? Or clairvoyance? Most of our yogas and practices deal with the Sambhogakaya. It's not as though the Nirmanakaya is here in life and the Sambhogakaya and Dharmakaya are somewhere else. You don't have to go to Wu Tai Shan. Just do tigle gyachen. There's very little actual understanding happening here. Just a lot of guessing. To understand rainbow body you have to understand the base. It's emptiness. There's no body. The Buddha Dharmakaya has no form. The form kayas are practitioners' level. The sambhog is the energy that recognizes Dharmata. If that recognition is complete there is only Dharmakaya. Guru Rinpoche doesn't sometimes appear as a human and sometimes like a sambhogakaya. 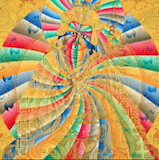 Guru Rinpoche is Dharmakaya. The forms only appear to us based on our aspirations and level of wisdom. So talk about how big a sambhogakaya might be is complete nonsense. It would behoove folks not to conjecture like this. If you don't have a clear lineage explanation, giving your own opinion is dangerous. People think oh I will attain something. This is completely wrong. No one attains anything. The elements dissolve because of this. If there is that merit and interdependence, due to the blessing of the Dharmakaya, forms can appear to disciples in their own minds. Like today is guru day. Guru Rinpoche promised to appear to anyone who call him. But he's not somewhere hearing something and get in his sleigh like Santa Claus. He established this cause in his human form. So this form has this benefit. The moment you project this idea of a being with a form who comes to you, you distort so that you cannot have any realization. Dzogchen often reads as if there someone taking a form as if its a choice. But this is misleading. Otherwise it's just the idea of becoming an angel of light. This is a god realm notion. It's not what Dzogchen is really saying. No one is contradicting interdependence and cause and effect. Yogini tantras also have the result of rainbow body leaving onl hair and nails, and great transference. Even though dzogchen says togal is only way. Actually there are other ways like longde, yangti and yogini. What must be understood is that you can't sort this out yourself. There are little glitches in these texts to throw off the uninitiated. You know dzogchen attracts people me included with the rainbow body idea. But it's not what it seems. What's happening is Westerners are importing ideas from Western religions with our hopes to be like Jesus. Garchen Rinpoche explained to me there's no body; and one must first understand the base before the result becomes clear. 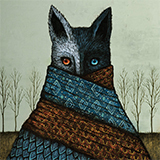 Trying to understand the result from dualism vision is a sure way to never realize it. deepbluehum wrote: There's very little actual understanding happening here. Just a lot of guessing. To understand rainbow body you have to understand the base. It's emptiness. There's no body. Dzogchen often reads as if there someone taking a form as if its a choice. But this is misleading. Otherwise it's just the idea of becoming an angel of light. This is a god realm notion. It's not what Dzogchen is really saying. No one is contradicting interdependence and cause and effect. Yogini tantras also have the result of rainbow body leaving only hair and nails, and great transference. deepbluehum wrote: Yogini tantras also have the result of rainbow body leaving onl hair and nails, and great transference. Great post, deepbluehum. How do the methods for rainbow body in the Yogini tantras differ from in Dzogchen?